What Does "Growth" Mean In My Email Analytics? In GoDaddy Email Marketing's email analytics, the growth statistic is your signups and your unsubscribes. The total on the growth tab is calculated by taking your total subscribers from that newsletter, minus your total unsubscribes from that newsletter. This means that you may sometimes have a negative total in your growth tab. The subscribers that are counted are only the folks who have signed up using the default signup form link -- in this email, only. 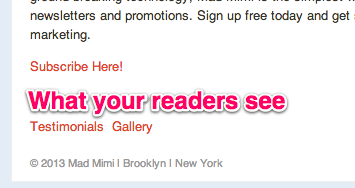 Most often, and by default, this link is included in the campaign footer. 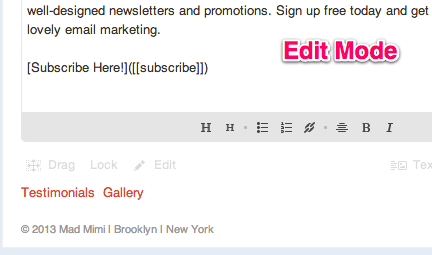 However, you can use our Campaign Tweaks add-on feature to move that button to the top of your email, too. How Do I Set Up My Subscribe Link? There are actually two different ways to add a link for people to sign up to your email. You must have a signup form already created, to do either -- and it must be set as your default signup form. For those first two steps, read on... Or jump to the second option of adding signup forms using a macro. Click on Signup Form option at the top of your page. How Do I Encourage New Readers To Subscribe? Encouraging your current readers to share your campaigns via the forward to a friend link, or on social sites is one of the best ways to build your subscribers and create growth. Your readers already value your content and are likely to want to help! Link placement is another key factor in subscriber growth. As long as you set up your default signup form, we include a subscribe link in your campaign footer. But why not place a subscribe link at the top of your campaign, too? You can use the [[subscribe]] link macro, or try our campaign tweaks options. What Are the Advanced Signup Form Options?